We have a specialist corporate services team who offer bespoke services to a number of industries for business of many sizes. 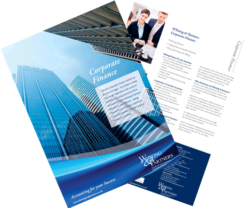 Traditionally, corporate finance services are viewed as the sale and purchase of businesses; however it also includes other types of work such as business planning, fundraising, business acquisition and exit planning. Through the life-cycle of a business it is likely that a number of these services will be required. In addition, for highly specialised corporate finance, tax, legal or marketing issues, we have access to some of the best technical support available. Get in touch with your local office and speak to one of our specialist advisers about our Corporate Finance services. We have successfully advised the business owners of an engineering firm on its £1m buy out by the existing management team. Our team were initially approached by the business owners for exit planning advice.